Jalandhar 7 September (Jaswinder Azad)- To welcome the new students of the department, a Fresher Party ‘Abhinandan 2018’ for the students of classes BCA & B.Sc. (IT) of Department of Computer Science & IT of Lyallpur Khalsa College Jalandhar was held on Friday. Principal of the college, Dr. Gurpinder Singh Samra was the chief guest at the function. Speaking on the occasion he welcomed the students and motivated them to work hard and make a mark for themselves in the future. The Head of Department, Dr. Manohar Singh welcomed the chief guest on the occasion. Principal along with the HOD gave away prizes to the title winners. During the event, lot of enthusiasm was seen among the students. A ramp walk was held for the first year students, along with games and guest performances. Their intellectual level was also tested through a question answer round. The winners of the various titles at the event were as follows: Ms. Fresher-Simran of BCA, Mr. Fresher Gurtegbir, Ms. Charming Shabnam of B.Sc-IT, Mr. Handsome Tamri Singh, Mr. Intelligent Sahil Jaiswal of B.Sc-IT. HoD Manohar Singh extended best wishes to the winners. The students of the Department conducted the stage in a very confident manner. During the occasion Prof. Sanjeev Anand, Prof. Sandeep Bassi, Dr. Baldev Singh, Prof. Manpreet Singh, Prof. Sandeep Singh, Prof. Mandeep Bhatia, Prof. Gagandeep Singh & Prof. Ratnakar were also present. Jalandhar 6 September (Jaswinder Azad)- Department of Cosmetology of PCM S.D. 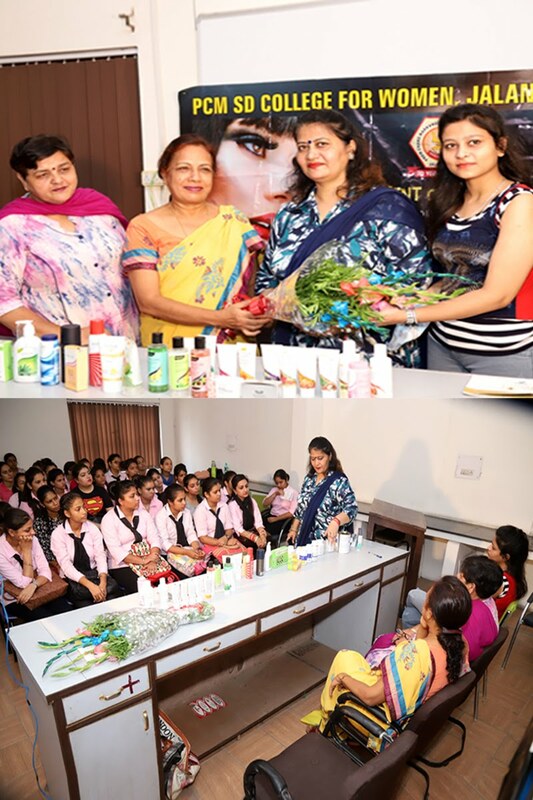 College for Women, Jalandhar organized a seminar on Skin and Hair Care products by Sonia Sharma from Vertige Cosmetics and Health Care. She provided several skin and hair care tips for using shampoos, conditioners, Spa creams, face washes, sunscreens and facial creams. Healthy Skin and hair are the chief essentials to one beauty regimen and one must be aware of the pros and cons of these products before using them. Jalandhar 6 September (Jaswinder Azad)- Abhilasha Sharma of Lyallpur Khalsa College Jalandhar has bagged 1st position in the University exams of M.Sc. (Biotechnology)-IV Semester by getting 1141 marks out of 1400, whereas Priya Nischal bagged 2nd by getting 1106 marks respectively in the same class. This information was given in a press release by the Principal of the College Dr. Gurpinder Singh Samra. The President of the College Governing Council Sardarni Balbir Kaur congratulated the students and wished them success in life. Dr. Arun Dev Sharma Head Department of Biotechnology was also present on this occasion. Jalandhar 6 September (Jaswinder Azad)- Taking lead in academia, Kanya Maha Vidyalaya- the Autonomous and Heritage Institution organised the 2nd meeting of Academic council with the intent of ensuring excellence in education. The meeting was chaired by Prof. Atima Sharma Dwivedi, Principal KMV and was graced by acclaimed luminaries as members. Dr. Nikhil Kumar, Education officer from UGC, Dr. N.S. Tung Professor, Dept. of Psychology, Guru Nanak Dev University Amritsar, Dr. Jagrup Singh Sekhon, Prof. Dept. of Pol. Science, Guru Nanak Dev University, Amritsar, Mrs. Karamjit Kaur Chaudhary Former-DPI, Education Department, Punjab Govt. along with the Deans and Heads of Departments of KMV provided their valuable inputs as members of Academic Council. Prof. Atima Sharma Dwivedi, Principal KMV apprised the erudite academicians that new policies have been made to deal with examination and research in order to acquire excellence in teaching and evaluation. The examination policy at KMV will be student-friendly which will provide an apt platform to the students to display their brilliance, hard work and intellect. The aim will be to provide complete justice to students and also to evaluate them in a flawless manner. This was followed by exhaustive discussions for the implementation of new programmes for students, along with the regular teaching, for their holistic personality development. On this occasion presentation regarding Examination policy was made by Ms. Hardeep Kaur Controller of Examinations who threw light on the upcoming reforms in KMV Examination policy. A presentation on research policy was made by Dr. Jatinder Pal , Dean Research. He gave an account of the KMV initiative of giving SEED money to the student researcher who excels in the arena of research. Ms. Ashoo Bajaj in her presentation on sports policy of KMV threw light on the enhancement of sports facilities for the students. ECA policy was also shared in her presentation by Dr. Gurjot. Dr. Shalini Gulati shared information regarding the introduction of Module based Moral Education programme and Dr. Gurjot explained the foundation Program which has been introduced for the new entrants. Credits will be awarded to both the Moral Education Program and Foundation Programe. All the members endorsed that the up-gradation of syllabi and other reforms which had been done after considerable deliberations will be very beneficial for the students and will help them to forge ahead in life. Dr. Nikhil Kumar acquainted all present with the new scheme of UGC and expressed his appreciations of the excellent work done by KMV. Prof. Atima Sharma Dwivedi averred that these reforms which meet global standards will help students gain an edge and get assimilated in global education system. 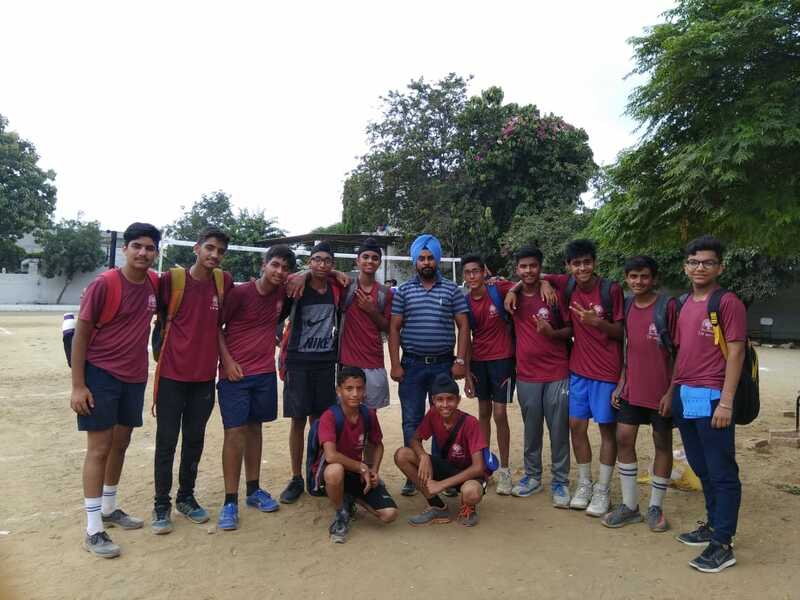 Jalandhar 6 September (Jaswinder Azad)- The students of Innocent Hearts School , Loharan brought laurels to the school by achieving Gold and Bronze medals in Punjab Zonal Tournament. The players of Volleyball U-14 girls showed dominance over Government Girls School. The category U-17 boys showed their skills and defeated the team of APJ School and bagged gold medal in U-14 category for silver medal. The category U-17 boys and U-14 girls bagged the bronze medal. The players performed well in Table tennis and Cricket too. The winning teams have been selected for district level. Director Principal Schools Mr. Dheeraj Banati congratulated the winners, H.O.D. 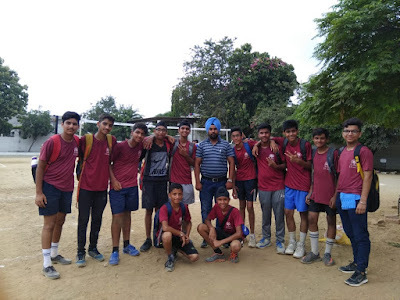 Sports- Mr. Sanjeev Bhardwaj and their coaches and wished them good luck for the upcoming district level matches. Dr. Anup Bowry – Academic Secretary of Bowry Memorial Educational and Medical Trust congratulated the students and mentioned that selected students will be awarded concession in tuition fee. Jalandhar 6 September (Jaswinder Azad)- Under the able guidance and motivation of Principal Prof. Dr. (Mrs.) Ajay Sareen, Hans Raj Mahila Maha Vidyalaya joined hands with the NGO Shkkti Foundation to send relief to Kerala Flood victims who have witnessed their worst damage. On this occasion, Principal Dr. Sareen said that HMV has always supported the social work programmes and wanted to do its bit to assist the flood affected people in rebuilding their lives. 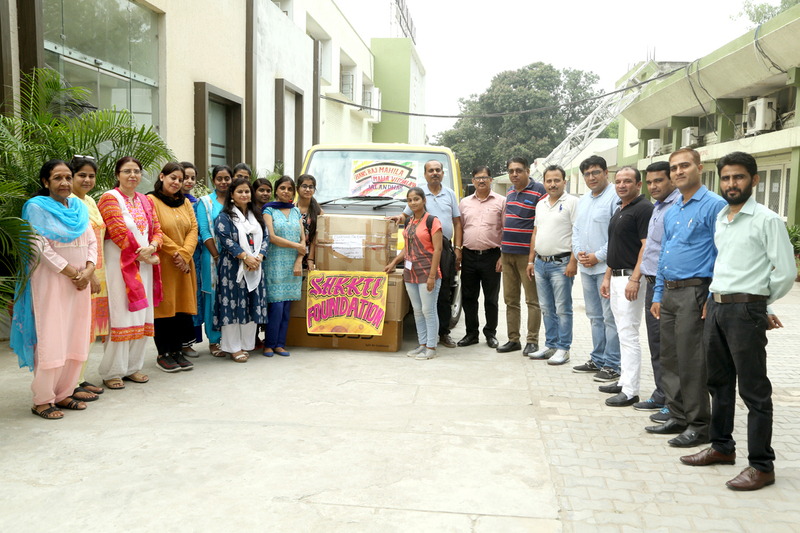 Bed sheets, sanitary napkins, sarees, clothing were collected by the staff of HMV and students and sent to Kerala. NSS Programme Officer Dr. Anjana Bhatia said that we hope that our little help will strengthen the rehabilitation effort in Kerala. School Coordinator Mrs. Meenakshi Syal also motivated the HMV Collegiate School staff and students to contribute to the cause. Mrs. Kuljit Kaur Athwal, Staff Secretary Mrs. Veena Arora, Joint Staff Secretary Dr. Seema Marwaha, Miss Shama Sharma, Mr. Jagjit Bhatia, Mrs. Navneeta, Mr. Gautam, Mr. Shailender, Miss Surbhi Sharma, Ms. Beenu, Office Supdt. Mr. Amarjit Khanna, Mr. Raman Behl, Mr. Pankaj Jyoti, Lakhwinder Singh, Mr. Ravi Kumar and Mr. Rajiv Kumar were also present. Jalandhar 6 September (Jaswinder Azad)- Aanchal Malhotra of Hans Raj Mahila Maha Vidyalaya bagged 2nd position in BA/B.Sc(Economics) Hons. Semester-IV examination conducted by GNDU. She got 66 marks out of 100. Km. Kawalpreet Kaur stood 3rd securing 64 marks in BA(Economics) Hons. Semester-IV. Principal Prof. Dr.(Mrs) Ajay Sareen congratulated the students and wished them luck for the future. On this occasion Mrs. Chandrika, Ms. Harmanu were also present. Jalandhar 6 September (Jaswinder Azad)- It was a moment of excitement and thrill for the students to watch the 70 minute play titled D-Class by five graduates from National School of Drama (NSD), Delhi in Sardarni Manjit Kaur Auditorium, CT Group of Institutions, Shahpur campus. The play, which is a love story of a class-less student, written by Uday Prakash and Vikas Bahari left the audience spellbound. The play featured Aamir Mallick, Mahadev Singh Lakhwat, Debashree Chakrabarty, Ravi Chahar and Param Anand. Manbir Singh, Managing Director, CT Group of Institutions thanked NSD Graduates for visiting CT Group of Institutions and showcasing their play which is quite commendable and a treat to watch. Jalandhar 5 September (Jaswinder Azad)- Teacher’s Day celebration was held at Lyallpur Khalsa College on 5th Sep 2018 in the remembrance of Dr. Sarvapelli Radha Krishan. This occasion was organized in two sections by the PG Department of Biotechnology and History respectively. The program was graced by the presence of Dr. Gurpinder Singh Samra, Principal, Lyallpur Khalsa College and he was accompanied by Dr. Arun Dev Sharma, HOD, PG Department of Biotechnology and Dr. Suman Chopra, HOD, PG Department of History. A paper reading event was conducted in the Department of Biotechnology with the participation of students from M.Sc-I Sem and B.Sc II Sem Biotechnology Department. Words of wisdom were delivered by Principal Dr. Gurpinder Singh Samra motivating the students towards their goals and to focus on their academic development. Dr. Arun Dev Sharma praised the efforts of students and encouraged them to reach the pinnacle of success. Students of History Department Navdeep, Harpreet & Harpreet Kaur recited the poems on Guru shisha parampara and Principal Dr. Gurpinder Singh Samra made the studentss aware about the importance of teachers day & also told the students why Radha Krishanan Sarvapelli’s Birth Day 5th September is dedicated to the teachers day and he also appealed the students to maintain healthy relationship with their teachers. In this ceremony, other staff members, Prof. Gobind Ram, Dr. Karanbir Singh, Prof. Amandeep Kaur, Prof. Sandeep Kaur, Prof. Shubhneet Kaur, Prof. Navjot Kaur, Prof. Rajvir Kaur and Prof. Suraj Bhagat along with research scholar Priya were also present.